Bayonetta 2 Exclusive For Wii U! Home » News » Bayonetta 2 Exclusive For Wii U! Well this is something completely unexpected, Bayonetta 2 has officially been announced as an exclusive for the WiiU during today’s Nintendo Direct, immediately trending worldwide on Twitter. What is causing the most interest though is the way it was announced, as during the live stream Reggie Fils-Aime seemed to emphasise strongly that the game was published by Nintendo. The trailer shows Bayonetta (or at least her foot) attacking a robed figure with a large double bladed staff, the hail of bullets failing to even touch the individual. Is this a hell lord come to claim her soul at last or has the war with the Angels taken on a new turn? This screen from TSSZ News confirmed that the logo was indeed there still but other than this there was no mention of SEGA being involved in the live stream beyond this. Concentrating on Platinum Games’ other release The Wonderful 101 (previously knows as P-100). Nintendo UK also emphasised it is Nintendo published, a matter SEGA have eventually confirmed describing their role as an “advisor” to both Platinum Games and to Nintendo. There was lots of talk of the game being canned, so does this mean that it perhaps was canned but then finished by Nintendo? 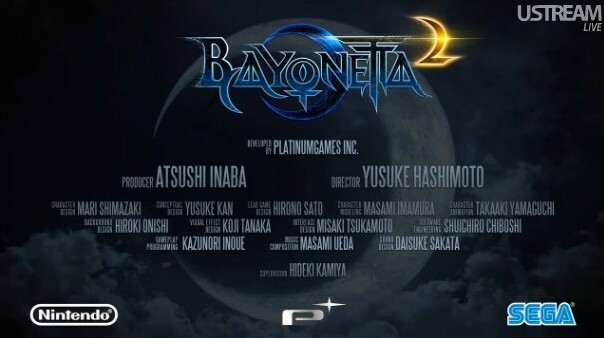 Whatever the case it seems from now on Bayonetta will have next to nothing to do with SEGA from now on it seems. What do you think of all this? Please comment below!